Jimmy the Gun: Pepsi, Where Are The Glass Bottles? I'm a member of both the Pepsi and Mountain Dew online news letters. I saw that Mountain Dew was introducing a new "art project" painted on a newly shaped "vessel" of Mountain Dew. Because I'm a believer that beverages taste better out of glass than aluminum, I naturally saw the shape of the new "vessel" and thought, "this is Pepsi's chance to introduce a line of their products, housed in glass." Last night I finally found a few of the Green Label Art edition Mountain Dews at a convenience store near my house. I was excited until I flicked one, confirming what I really did suspected all along. It's a bottle shaped aluminum can, with a pry off top. LAME! Why is Coca-Cola the one that has the bottles? Maybe it's because their soda already tastes so bad the classic glass bottles help sell that nasty tasting stuff. Why doesn't Pepsi Co. offer glass bottles? I, for one, would buy them over cans even if they were more expensive. I'm a connoisseur of soda. Once, I won a contest where Pepsi, Coca-Cola, RC Cola, and PC Cola (Lucky Grocery's store brand at the time) were all placed in different cups, hiding their identity. I was so good, I was able to tell all four apart and name what brand they were. (Thanks to my parents, PC Cola was the cheap stuff we had at home most of the time). Also, I used to drink 64 ounces of soda every day. A chain taco joint, okay Taco Bell, did business with one of my previous employers. Employees of the Bell would hook me up with huge discounts on food and free refills of my 64oz. PITCHER. Taco Bell was owned by Pepsi Co. at the time and my refills were Mountain Dew, Pepsi, or Wild Cherry Pepsi. 64oz.? Yeah, that's a half gallon, folks. And, yes, I gained a few pounds. I lost 30 of them in the academy by completely removing soda from my diet for 6 months. Man, those were horrible times. Anyway, all that to say: I'm not at all impressed with the Green Label Art project that Pepsi's Mountain Dew Brand is "Dewing." It's still a can. There is still that metallic taste left in the beverage. The only pure tasting sodas these days are from a fountain. And even that is not perfect. If a restaurant doesn't clean the machine, set the proper mix ratio, set the right temperature, purify the water properly, and so on, you will have a different experience at each place. Taco Tree in Auburn, California (either location) has the perfect mix for both Pepsi and Mountain Dew. I've always had the best experiences drinking Pepsi products from Taco Tree. Thanks to a meticulous owner, they have the best mixed soda in all of Northern California; at least all of Nor Cal I've been to. Here's another note about Pepsi: They lost the Baja Fresh contract. Guess who that hurts. Did you say everyone? That's correct. Pepsi loses sales. Baja Fresh loses my sales. And I don't get my Baja or Pepsi fill. (Do I sound conceded because I said everyone?) And Baja Fresh was pretty good at mixing the product. Red Robin, same thing. One server did run to the gas station across the parking lot and bought a 6 pack of Pepsi for my friends and me. We told her it was a horrible thing Red Robin did by switching to Coca-Cola products. She was an understanding supporter of the Pepsi People's cause and ran out and purchased the six pack. That was HUGE. So was her tip! Please produce a line of Pepsi products bottled in glass. I suggest the glass bottles be replicas of the classics for marketing purposes. I also suggest bottling your entire line of products. 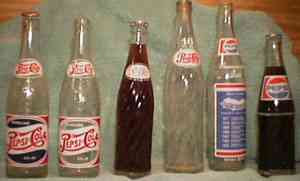 From Pepsi to Mountain Dew to Mug Root Beer, all your beverages would taste better from a glass bottle. Please do this soon, as the Coca-Cola fans are laughing at you for not doing this with the Green Label Art. I'm a Pepsi fan and I'm disappointed in the projects miss guided bottles. Also, since you're reading this, bring back Crystal Pepsi. That was good stuff. Yeah, it was different, but I liked it and so did most Pepsi fans I talk to. I will remain a fan regardless of your decision in these matters. I will find you in error if you don't follow my suggestions for classic glass bottles for the whole line and re-introduction of the classic Crystal Pepsi, but I will still love you more than any other soda company. Here are some reminder pictures. Brings me back to the days when the whole youth group would argue with Clay about Pepsi being better than Coke. I was on board with that. However, these days, I don't care which it is, as long as it's diet. I can't stomach that sugary stuff. 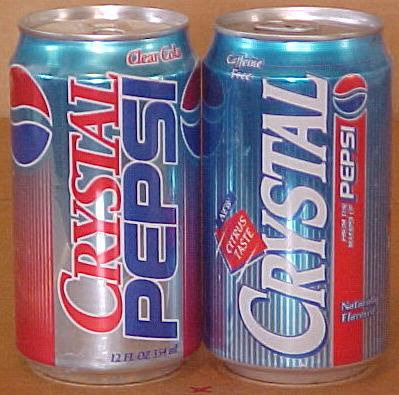 Never heard of the Crystal Pepsi, but I was a fan of Diet Pepsi Jazz varieties, which I do not see in stores anymore. They were so good! I don't know what happened.